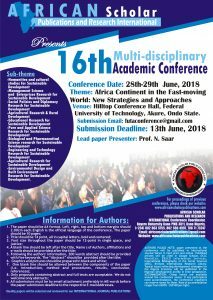 African Scholar Research and Publications International (ASRPI) is an autonomous learned society distinct from other national institutions. ASRPI is an independent research organisation dedicated to promote and encourage the pursuit of educational research and its application for both the improvement of educational practice and for the public benefit. The centre aims at creating a modern education centre of excellence that will provide value based education of international standards to keep pace with rapid industrial development in Africa. To bridge educational research across the many fields of educational practice and foundation disciplines. To bring together many internally renowned and young scholars, scientists and researchers in a multidisciplinary biannual conference. -To promote the exchange and dissemination of information on research findings that seeks to advance growth and development. -To lead in economic development by connecting business, research, education, government and talent to advance the competitiveness of our knowledge-based industries and Institutions, to build wealth that will enhance quality of life. Membership of the corporation is open to all educational researchers actively supporting the objects of the corporation. Corporate membership may be granted by the Executive Council to certain organisations on terms stipulated by the Executive Council. Membership will terminate automatically if annual subscriptions lapse beyond the time fixed by the Executive Council. for more information on how become ASRPI Editorial Board Member, Kindly use our Contact page.